Our Head Quarter village Dinsoft has 763 inhabitants. Our office was completely rebuilt the last year. We have now a very nice new office. The next ten years we will concentrate on globalization. and try to take over the transport lines of the competition. The income of the trains is again increased last year. We have to keep this going up. Our loan is still on the maximum, now $600,000. Out bank balance is now increasing rapidly. Where to start? Well it gave always a bit of irritation than there is a gold mine close to a bank and that we have no gold service there. We go to use an armored truck to transport gold. The location of the mine is very close to the bank in Drontburg. We try with one truck. If more are needed we can always add one. 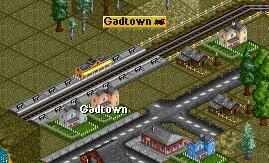 A few years ago we had a bus service between Gadtown and Dinsoft. Since this was a financial disaster we stopped with that. Now that we are a big company, we can afford to setup a service which has bad earnings at the startup. However, don't worry after some time we will earn money with this service. Well, after watching a few round trips, it makes already money. The railway station in Dinsoft was enlarged to four platforms to handle this new service. While looking around for a place to start a new service, we got an offer for a subsidized passengers transport from Fledingville to Tatfield. The distance between these to cities is not so very far, but we have to pass a mountain. During this construction we earned so much money that we immediately could buy a Turbo Diesel locomotive. On December 12 we've got the subsidy. Our earnings increased the previous year by about $500,000. We spent almost $400,000 for construction and new vehicles. We paid some load off and the bank balance goes to the right direction. 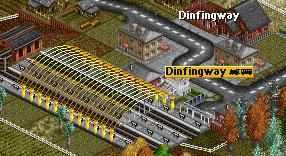 Is a bus from Dinfingway (367 inh. )to Ronwood (216 inh.) After a few weeks only there were already many passengers. So a train service was put in operation. In both villages we made some 5 squares long, two platform railway stations. Always good for future expansion. All villages in this valley are now connected by WWW Transport. In the mean time our office was again completely rebuilt. As you can see it is now multi-floor building with a large parking place. The company flag can be seen outside, in front of the building. 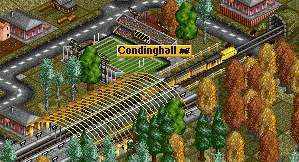 In the company league table, we are now "Director"
The next new service is from a new station in Tatfield to the railway station of Ronwood. This line goes almost all trough the mountains. It has two tunnels and one bridge; it was quite expensive. On the picture the new railway station in Tatfield and the railroad, which goes straight into the mountains. 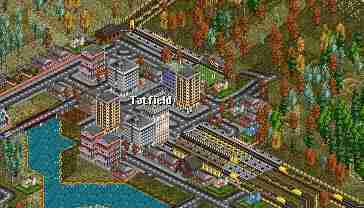 Tatfield is a large city with almost 2,200 inhabitants. It is located on the begin of the big river which goes to the delta near the sea. It's a very popular city for the competitor to start a bus service. 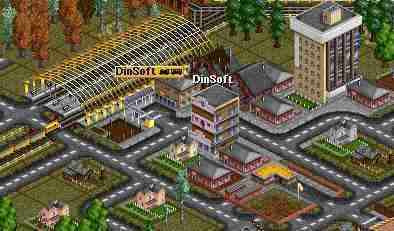 In this game there had been already four companies who started here. At the moment there is only one competitor left over in Tatfield. This is Gordon transport with only two busses. In the valley at the north we just found a small village, Saston with 115 inhabitants, not yet connected to or existing transport network. The closest village is Dinfingway. 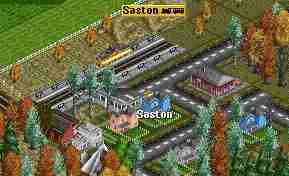 We made a single platform station in Saston and connected that to the already double station in Dinfingway. The train is small, one locomotive (112 km/h), one passengers car and a Mail Van. Again a new year. Our train income is now $2,230,246, an increase of about $200,000. Not so much. This is due too that we have almost only passenger transport. We need more coal and other things like wood. 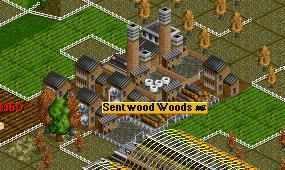 We had already a look for a wood transport service, there are already two forests, which can be connected, but there is no paper mill. 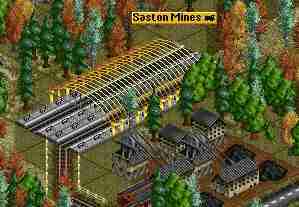 We go to supply coal from the Saston coal mine to the Betown power station. This is quite a large distance, but with our Turbo Diesel we can keep short transport times. At the end of the construction work we bought the new train and put it in service. Bank account only $20,000. Loan $ 700,000. The train arrived on July 26 and it earned $68,000. Not bad at all. Since the coalmine is very big, 270 tons of coal, we can make some double rail tracks and put a second train in operation. The first of July we got finally a Paper Mill. We have been a long time waiting for this. Now we can start a wood transport from the forests we have already. Almost a train income of $2,500,000, still a very low bank balance and the maximum loan. We have now 28 trains and three road vehicles. The company value is $7,586,285. On the Company League table we are "Director". Begin of June we started with the wood supply line to the paper mill. There are two forests, both above in the mountains. One produces 208 ton, the other one 117 ton of wood. We started with the biggest one and the train runs begin of October. With it's first trip it earned $52,230. Now the paper mill produces paper, but we have no printing work to supply this paper to. The second wood train was in operation just before the end of the year. Our train income increased to about $3,000,000, our loan is still $700,000. WWW Transport owns now 28 trains and three road vehicles. The value of the company is $8,889,546. In the Company league table we are now "Chief Executive". The railway from Brubourne to Tindhall Woods crosses the road near the Tindhall Woods railway station. A competitor uses this road for his food transport trucks. Normally these trucks stops when a train comes, but sometimes it goes wrong and then... booom, an accident. Wait and see. The last year was not too bad. our train income increased till $ 3,454,000, about a $400,000 more then the year before. We had also enough money to pay our loan back. It is now $0. 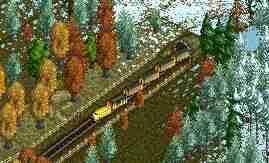 Last December we just started a new railroad between Frondhead Farm and Tindhall Woods. The same line can later be used to connect also the Pennville Farm. To complete it, we've made also a Food train between Tindhall Woods and Carfingley. We have to wait one or two months. The income of last year was almost the same as the year before. Also our Operation Profit graph shows some ups and downs. Not a really increase. Both trains were running end of May. They earn about $30,000 per trip. Due too this extra supply of Live Stock and Wheat we had to upgraded the food train from Tindhall Woods to Carfingley to a Turbo Diesel. This to improve the service. We opened a new passengers and mail service between Condinghall and Tedingville. "Driver dies in fireball after collision with train". This is one of the many messages during the game that you have to read. Our loan is completely paid off. No more loan. The income increased till about $4,000,000. After a look on the map it was found that there are still 21 villages without any transport. Now we get some more money we can connect them all. Income is now over $4,500,000. We have now 42 trains and 4 road vehicles. The Operating profit Graph goes continuously upwards. Due the higher number of trains we have, we needed to hire some more people. To make place for them our office was once more completely rebuilt. These services are not making any money yet, but they will improve the growth of the connected villages. In the mean time we got a message that train 1 is getting old, we need to replace is by a new one. Only the locomotive we can keep the cars. This will cost a lot of money in the next years. It are not only the trains to be replaced, but many times also the bridges. To save money, we built low speed bridges in the past; they are not suitable for the new, high speed trains. So in the case of train 1 we go to replace also the bridge from a 112 Km/hour type to a 241 Km/hour type. Well, the train and the bridge are replaced. We had again to borrow some money. The total cost of this replacement was about: $566.000 for the train and $28,332 for the bridge. November 5, the loan was already paid off. WWW transport has now 44 trains and 4 road vehicles. The income last year passed the $5,000,000. The coming year we will continue with our "Globalization". Transport for the whole world. Our investments in construction and new vehicles will remain very high. 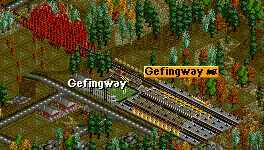 The first new transport services for the year 1989 is from Hunningwell to Gefingway. 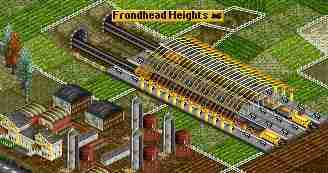 Both railroad stations are a bit oversized for the (at this moment) small villages, but we do aspect some growth. The above graph shows the Operating Profit from January 1984 till December 1989. As you can see, the competitors are almost on the zero line. They will never go up. On the right is the "Company League Table. "WWW Transport" is now with "Chairman" the number one. You can see how many vehicles we have and the value of the company. There is also a "View HQ" link which brings you to our headquarter. Don't forget to look at the portrait; it's the big boss himself, never getting older during these hunderd years.